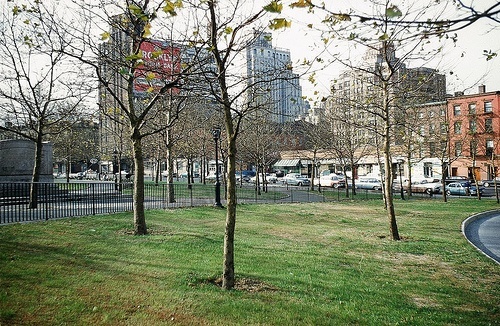 At Mayor de Blasio’s Town Hall at St. Francis College this (Wednesday) evening, he announced that $6 million has been appropriated to renovate the northern end of Cadman Plaza Park, which he said he was surprised to learn had not been touched, apart from routine maintenance, since the late 1950s. Among the improvements will be water fountains. A local resident complained of the noise on Saturdays from permitted work on the former site of the Brooklyn Heights branch library, now to become a high rise residential and commercial tower with a new library in its ground floor and basement. The Mayor called on a representative of the City’s Buildings Department, who announced that the permit for Saturday work is ending immediately. Asked by local resident Toba Potosky about the prospects for the BQX or “Brooklyn-Queens Connector,” the proposed streetcar line connecting Sunset Park, Brooklyn to Astoria, Queens, mostly along or near the waterfront but with a likely detour around Brooklyn Heights and through Downtown Brooklyn, the Mayor said he is enthusiastic about the project, but said it was not likely to begin to be built before 2020. While there was enthusiastic response to the Mayor’s confirmation that the “Pop-Up Pool” in Brooklyn Bridge Park will remain open for one more summer next year, an audience member asked about the possibility of replacing it with a “floating pool,” perhaps along the lines of the barge-borne Floating Pool Lady that was docked to Pier 5 in 2007. Te Mayor said this is under consideration, but called on a city official who said that “legal issues” need to be resolved. 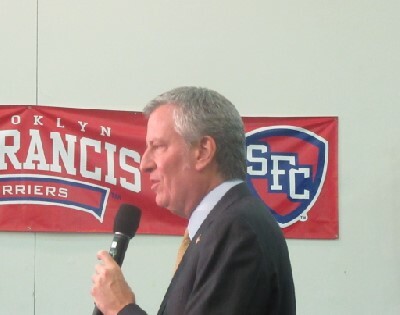 The Mayor spoke about other borough and city-wide issues, including “3-K,” which will provide free, day long pre-school for all kids age three through kindergarten, improved police training and community involvement, and, in response to a question from a St. Francis student, New York City’s efforts, along with those of some 300 other U.S. cities, to exceed the requirements of the Paris climate accord. Photo: Claude Scales for BHB. I don’t have an explanation but I find it very curious how little BHB commentators have cared about the BdB town hall, both before and after the fact. Because the BHB community, like many in NYC, doesn’t have confidence that BdB will accomplish much of anything as mayor? I don’t think this Cadman Park renovation is going to end well. Is this supposed to make up for the Library debacle? BTW if it matters, I am a Democrat who did not, and will not ever, vote for Mayor de Bla-bla-bla-sio. God help the city for having to go through four more years of him and his corrupt administration. poorly led and significantly discouraged and the banks/real estate “industries” are running wild with foreign and speculator capital. The dawn of condos and whole buildings which are the new Swiss banks and huge explosions of new yuppie self contained cities like in LIC and our downtown all while you keep police/fire/ems manning at or almost at former levels and every ‘young thug’ in the universe now has the attitude they own whatever neighbor they’re in at the moment.. Yeah there’s a lot he’s accomplished!!! I thought Cadman Plaza Park was to be “remodeled” in some kind of master plan that involved a wider area including the Korean War Veteran’s Memorial, etc.? It was floated a couple years ago, so it may have fallen by the wayside. FWIW, I think De Blasio’s been a very good mayor overall. Crime has steadily declined to its lowest point in modern history, the local economy is humming, roads are being repaved, and universal pre-kindergarden is in place. Not that some things couldn’t be better (homelessness and cleanliness are weak spots) but still, he’s got my vote for a second term. “Reported” crime is down, repeat “reported” crime is down. Crime is not. I have seen and heard of many instances where crimes, even involving knives and physical violence have been “finessed” by the police who respond into nothing. People have been physically abused and don’t bother calling the police because nothing gets done. The last time this happened was during the Dinkins administration. Things just don’t make it to the reporting stage. The whole “reported” crime thing isn’t impossible, but there’s no real evidence that few crimes are reported. In the absence of evidence of that, I’ll rely on what we’ve got. $6M is new. And I don’t know where this image comes from but the plan that Jorale-man is referring to is called “The Strand.” I wouldn’t have figured this out without your illustration, mislabeled as it is. Did anyone raise the Pier 6 towers and his prior view they were too tall? How does one “prove” the non report of a crime. No report means no evidence. I have, however, actually seen police ignore incidents and just move on. I am not one who is untruthful. I know what I saw and what I saw was the ignoring of a criminal act. One of the ways that 6’5″ stack of BS skewed the stats is by decriminalizing “Quality of Life” crimes, like peeing or drinking in public. those are now civil violations not criminal violations. How on earth you could like him is beyond logic, he is a corrupt shill for the developers that are wrecking this city. Remember LICH? nuff said. How can anyone say that crime is down? Stuff gets stolen, and why report it? There are men who make everywhere their toilet, our gardens are being turned into dumps (came home today to find an old stereo receiver tossed onto my hostas), drivers run red lights and stop signs, and where are the cops? Our quality of life is plummeting. Our City Council must never take trains if they have to ask New Yorkers what would make them better, and why they can’t smell the urine on almost every block is beyond me. As for the library, it’s a lie to say there will be more room for books. But hey, let the big honchos talk. It’s not easy to determine unreported crime. There’d have to be a way to estimate. Maybe comparing calls to the police against actual crimes reported over time. But most importantly, the isssue isn’t whether unreported crime happens, it’s whether a higher percentage of crime goes unreported now than it used to. As for your anecdotal observations, I trust you far less than I trust the average anonymous internet commenter. The Saturday work on the Cadman Plaza luxury housing (former library) most definitely is NOT immediately suspended. Workers were at it furiously today (Saturday 10/28). The workers appear to be taking some steps to minimize noise (supposedly one of the developers lives a few blocks from the site) – but it is a gigantic project, with heavy earthmoving equipment going deep, and numerous muffled but building-shaking explosions/heavy drilling over the course of this Saturday, same as weekdays. And we’re only beginning. 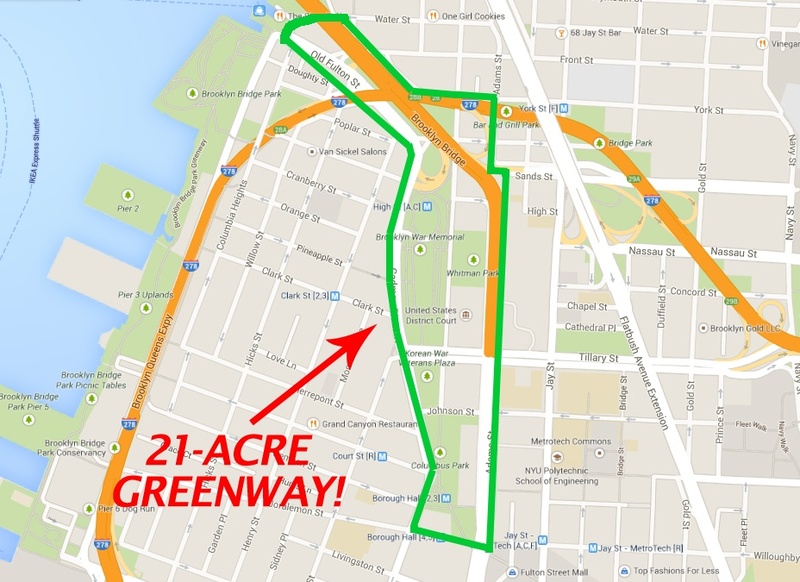 One hopes that when the behemoth is finally finished, and the wealthy new owners move in, they will be protective of THEIR quiet — i.e., trash pickups, deliveries, etc., and we neighbors can finally get some benefit from this mess.